« Honoré de Balzac in early films. 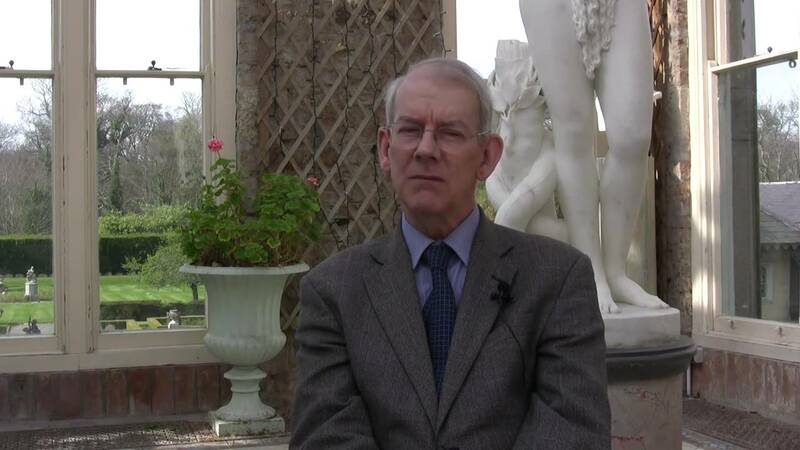 “To honour the 50th anniversary of The Parade Gone By… we gave Kevin Brownlow carte blanche to select six films he wanted to see at the Giornate.” [Festival Catalogue). “There was much more to come. Winstanley, Hollywood, Thames Silents, Unknown Chaplin, and all the documentaries, Photoplay and all its restorations and productions and new books to go with them. In 1980, with the collaboration of David Gill and Carl Davis, Napoleon … gave back to audiences the long-forgotten thrill of a theatrical and orchestral performance of a “silent” film. An Academy Award was the least tribute that Hollywood could offer to its great chronicler” (Festival Catalogue). A more notable honour was the first Jean Mitry Award  along with his collaborator David Gill. And as noteworthy have been the BBC radio dramas chronicling his work on Napoleon and his film Winstanley. I remember reading the book in the early 1980s and then through the Hollywood series and the Thames Silents discovering the real and proper experience of watching [and listening] to silent film. I later enjoyed the further series The Other Hollywood, though unfortunately it was not given the space and resources accorded Channel 4’s Hollywood. 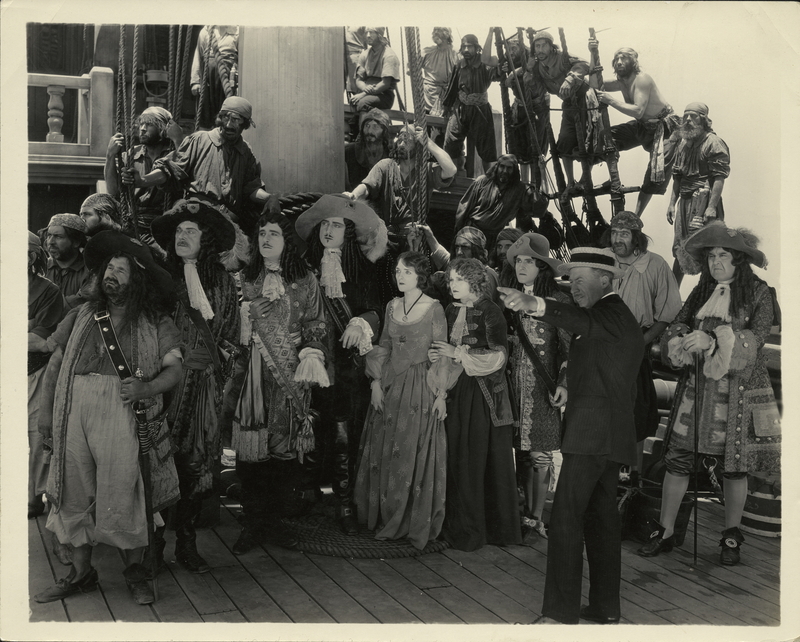 I have on many occasions enjoyed the meticulous restorations of early film, and enjoyed the prints that Kevin has saved for posterity, including at the London Bioscope screenings. So I waited with anticipation to see the selection that Kevin chose. Happily five of the six were on 35mm. Given the subject of the celebrated book these were all titles from Hollywood Studios. But they offered a varied selection of genres, stars and craft people and of styles and techniques. “almost never in the history of western migration did an Indian war party descend upon a circle of covered wagons.” [Quoted by Kevin). Shot mainly in Nevada and Utah what stood out in the film was the visual presentation and the impressive settings and landscapes. In fact I thought the film more stately that dramatic. There are some well-staged action sequence. The film used actual square-riggers and miniatures and some of the editing between these made the effects somewhat obvious. And the titles use of ‘Irish colloquialism’ for Peter Blood [originally a Irish physician] seemed quaint. But it worked well overall as it did on release, becoming the highest grossing picture produced by Vitagraph. The early scenes where Jane Vail (Pauline Frederick, excellent in the part) dominates her factory managers were a delight. Then Jane is taken with a young foreman, Robert (Malcom McGregor) who attracts her attention and then her emotions. 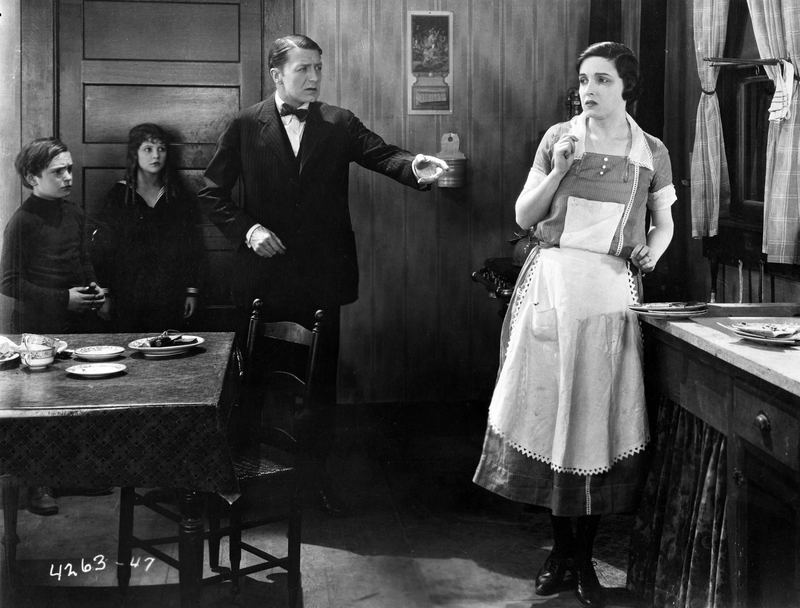 Rather predictably Robert then falls for the younger sister Dorothy (Laura La Plante). This part of the drama seemed rather conventional but the three leads are good and we actually get to see an outdoor expedition in Yosemite. O also thought that Tully Marshall as Scotty and Wanda Hawley as Lucy were excellent in their supporting roles. The film also has a nice turn in irony. Part of the reason may be the original novel by Dorothy Canfield and the adaptation by Mary O’Hara which follows the book closely. Kevin also notes that Baggot had an alcohol problem which may have affected some of his work. Seemingly not on this picture. Alice Joyce, a fine actress, plays Eva Knapp imprisoned at home with growing children whilst her husband Lester (Clive Brooks in a rather untypical role] is less than successful at his office job. His situation leads to depression and an unsuccessful suicide. But his subsequent incapacity finds Eva going out to work and becoming a higher earner in a department store whilst Lester finds hitherto hidden paternal virtues. Thus the whole family find an improved way of life: one that rests, as we learn, on a dubious moral decision. I agreed with Kevin, as did many of the Giornate audience about the quality and interest of this film. I was, though, less convinced by the situation but the sterling cast certainly make their characters convincing. The Enemy from M-G-M in 1927 enjoyed the services of Fred Niblo as director and Lillian Gish as star. The film as it survives is missing the last reel but whilst the end is not necessarily predictable the judicious use of stills and titles is sufficient. Lillian’s Pauli is the daughter of an Professor in Vienna (Frank Currier) ; we are familiar melodrama territory here. Pauli marries her sweetheart Carl (Ralph Forbes) just before he leaves for the front in 1914. 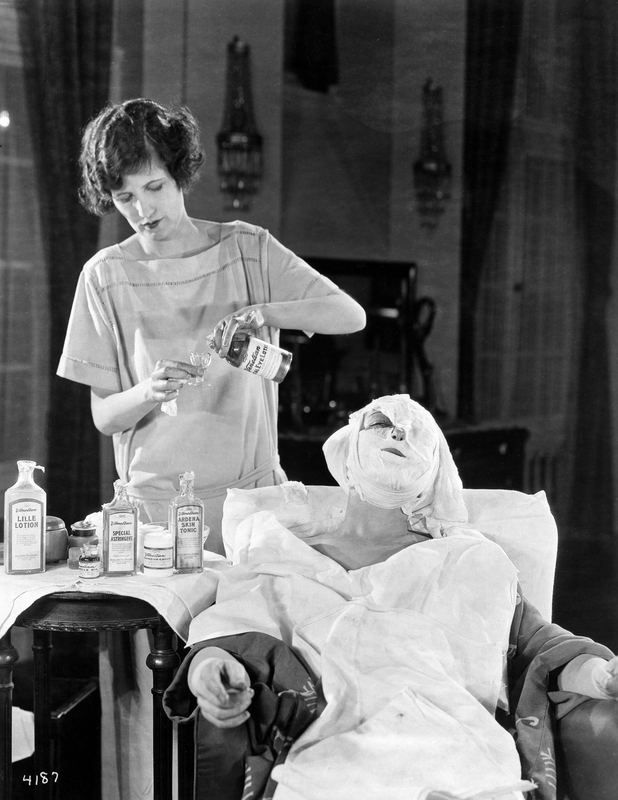 Most of the film is set on the home front as shortages increase. Pauli and her father suffer more because he holds pacifist views. The melodrama here is conventional but seeing Lillian Gish actually play a woman reduced to prostitution is definitely a one-off. Technically the film has some splendid sequences with dissolves and superimpositions. The domestic scenes are well handled. But there are probably two many similar scenes of troops marching off to war though, noticeably, the civilians become less and less enthusiastic. 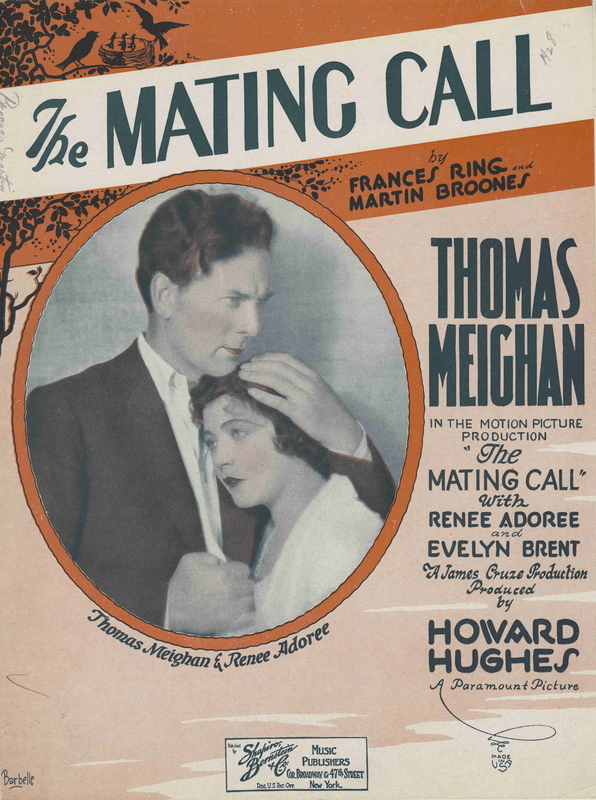 Then we had The Mating Call (1928) from Paramount Pictures and also directed by James Cruze. The film was adapted from a novel by Rex Beach. The story offered a rather unusual situation. Leslie Hatton (Thomas Meighan) returns from the Western Front in 1919 to find his sweetheart and wife [as the thought] has had the marriage annulled and re-married. In this complicated situation Leslie gets himself a ‘mail-order wife’; though he actually finds her by going to Ellis Island and selecting a young woman from among the immigrants, Renée Adorée as Catherine. What develops much of the drama is a secret vigilante group who rides round in black hoods terrorising people who are thought to break the conservative moral code of the small town. [They are not the Ku Klux Klan as some reviews suggest]. The direction is good and the two leads are excellent. The vigilantes seem rather cack-handed but they do help develop the drama. Some of the continuity is eccentric, Catherine insists on her parents accompanying her to Leslie’s farm but after one shot of them hoeing a field they disappear. This entry was posted on October 26, 2018 at 7:55 am	and is filed under Festivals, Hollywood. Tagged: 35mm films, Le Giornate del Cinema Muto. You can follow any responses to this entry through the RSS 2.0 feed. You can leave a response, or trackback from your own site.